Puritan Avenue is also known as 75th Road, although the latter name is rarely used, residents said. QUEENS — When Forest Hills resident James Freeley called 911 earlier this month because he suspected someone had broken into his car, the operator couldn't find his address. Five minutes later, the dispatcher finally found Freeley's home on Puritan Avenue. That was only after he provided the nearest cross streets and the precinct he lives in, he said. “If somebody was having a heart attack, taking five minutes to figure out where you were is a problem,” said Freeley, 72. Mix-ups such as these are "a chronic issue citywide," including in Hamilton Beach, a small neighborhood near JFK that has had street names changed twice in the past couple of decades, said state Sen. Joseph Addabbo who represents the area. The NYPD, which oversees the 911 dispatch system, could not immediately say how many similar incidents there have been. It was also not clear how many dual-named streets there are in the city. In the Forest Hills case, the street was only logged in the 911 system as 75th Road. 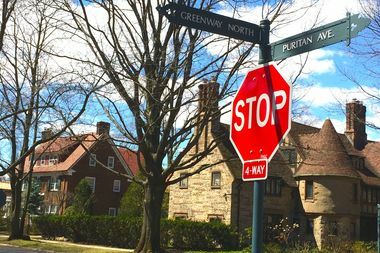 Puritan Avenue only applies to the portion of the street inside the private community of Forest Hills Gardens and the name has stood since the street was first created in 1909, according to Queens historian Michael Perlman. A similar situation applies to busy 71st Avenue, which becomes Continental Avenue in Forest Hills Gardens. The 911 mapping system, based on maps from the Department of City Planning and the Department of Information and Technology, is updated as soon as the agencies are notified about street changes or potential glitches, police sources said. And the issue on Puritan Avenue was solved as of last Friday, less than a week after Freeley reached out to local officials, according to authorities. “When I became aware of this problem … we immediately understood the obvious seriousness and gravity of the situation,” said Councilwoman Karen Koslowitz, who represents Forest Hills. In Hamilton Beach, streets switched to a numerical system decades ago, like most of the rest of the borough. But they reverted to their original names after Addabbo pushed for it a few years ago after a fire broke out in 2007 and firefighters spent 15 minutes driving around Howard Beach instead, Addabbo said. However, the 911 systems weren't immediately updated to reflect the change. “The problem is that when the city does street renaming it has to be a map change too,” Addabbo said. The lag happens because the process of keeping the system up to date involves multiple agencies, including the Department of City Planning and the borough's topographical bureau, Addabbo said. Now, both numerical and name monikers of streets are included in the system and street signs in the neighborhood have also been updated to show both names, officials said. The mix-ups have happened more all over the city, especially in the years following 9/11 when numerous streets were named after firefighters and police officers who died, Addabbo said. “People [calling 911] read out a street that has been renamed after a deceased firefighter after 9/11 and that name is not on our city map and it’s not in our 911 system,” he said. Hundreds of New York streets had their names changed over the last few years, according to SteveMorse.org, a website documenting the changes. But it was not immediately clear exactly how many times changes have created a problem for 911 dispatches and first responders. Rudy Orozco, a spokesman for District Council 37, a union representing 911 operators, said dispatch issues relating to dual-named streets are only occasional. “Glitches usually involve a street that’s recently had a name change, such as when they name a street after a dignitary or a local hero,” Orozco said in an email. To reduce confusion, residents who live on streets with two names should provide 911 operators with as many details as possible, including their zip codes and intersections, Addabbo said. “Give as much information as you can so that it makes it easy [to locate it in the system] and facilitates the emergency vehicles finding the location,” he said.